Glutinous rice (Oryza sativa var. glutinosa; also called sticky rice, sweet rice or waxy rice) is a type of rice grown mainly in Southeast and East Asia, which has opaque grains, very low amylose content, and is especially sticky when cooked. It is called glutinous (< Latin glūtinōsus) in the sense of being glue-like or sticky, and not in the sense of containing gluten. While often called "sticky rice", it differs from non-glutinous strains of japonica rice which also become sticky to some degree when cooked. There are numerous cultivars of glutinous rice, which include japonica, indica, and tropical japonica strains. Glutinous rice is grown in Laos, Pakistan, Thailand, Cambodia, Vietnam, Malaysia, Indonesia, Myanmar, Bangladesh, Northeast India, China, Japan, Korea, Taiwan, and the Philippines. An estimated 85% of Lao rice production is of this type. The rice has been recorded in the region for at least 1,100 years. Glutinous rice can be used either milled or unmilled (that is, with the bran removed or not removed). Milled glutinous rice is white in color and fully opaque (unlike non-glutinous rice varieties, which are somewhat translucent when raw), whereas the bran can give unmilled glutinous rice a purple or black color. Black and purple glutinous rice are distinct strains from white glutinous rice. In developing Asia, there is little regulation, and some governments have issued advisories about toxic dyes being added to colour adulterated rice. 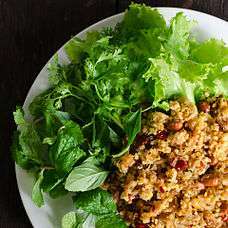 Both black and white glutinous rice can be cooked as discrete grains, or ground into flour and cooked as a paste or gel. Sticky rice, called bora saul is the core component of Assamese sweets, snacks and breakfast. They are widely used in every kind of traditional sweets of Assam which are very different from traditional sweets of India of which basic component is milk. Different Assamese communities make rice beer from it which is preferred more than other rice, as it is sweeter and more alcoholic. They also offer this beer to their gods and ancestors (demi-gods). Rice cooked with it is also taken directly as lunch or dinner on rare occasions. In Bangladesh specially in Chittagong, Cox’s Bazar and Sylhet areas the sticky rice called bini dhan(unhusked sticky rice) is very popular. Both white and pink varieties are cultivated at many homestead farms. 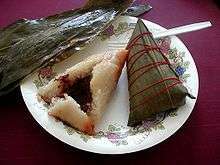 Husked sticky rice is called bini choil (chal) in some dialects. Boiled or steamed bini choil is called Bini Bhat. With meat or fish curry and grated coconut, Bini Bhat is a popular breakfast. Some times it is eaten with a splash of sugar, salt and coconut only without any curry. Bin dhan also used to make khoi (pop rice like pop corn) and chida (bitten husked rice). Apart of these many other sweet items made of bini choil are popular. One of the favorite pitas made of bini choil is atikka pita (pita).It is made with the mixture of cubed or small sliced coconut, sugar or brown sugar, ripe banana and bini choil wrapped with banana leaf and steamed. Another delicacy is Patishapta pita made of ground bini choil. Ground bini choil is sprayed over hot pan and mixture of grated coconut, sugar, milk powder and ghee sprayed over it and rolled out. Dumplings made of powdered fried bini choil called laru. First bini choil is fried and ground into flour. This flour is mixed with sugar or brown sugar, and ghee or butter and is made into small balls or dumplings. One kind of porridge or khir made of bini choil is called modhu (honey) bhat. This modhu bhat becomes naturally sweet without mixing any sugar. It is one of the delicacies of local people. To make modhu bhat first prepare some normal paddy or rice (dhan) for germination by soaking it in the water for few days. After coming out of little sprout dry the paddy and husk and grind the husked rice called jala choil into flour. It tastes sweet. Mixing this sweet flour with freshly boiled or steamed warm bini bhat and then fermenting the mixture overnight yields modhu bhat. It is eaten either on its own or with milk, jaggery or grated coconut. The Htamanè pwè (festival) takes place on the full moon of Dabodwè (February), when htamanè is cooked in a huge wok. Two men, each with a wooden spoon the size of an oar, and a third man coordinate the action of folding and stirring the contents, which include kao hnyin, ngacheik, coconut shavings, peanuts, sesame and ginger in peanut oil. Paung din (ပေါငျးတငျ) is another ready-to-eat portable form cooked in a segment of bamboo. When the bamboo is peeled off, a thin skin remains around the rice and also gives off a distinctive aroma. Nga pyaw douk, banana in glutinous rice, wrapped in banana leaf and steamed and served with grated coconut - another favourite snack, like kao hnyin baung and mont let kauk, sold by street hawkers. Cifangao (Traditional Chinese 糍飯糕, Simplified Chinese 糍饭糕) is a popular breakfast food originating in Eastern China consisting of cooked glutinous rice compressed into squares or rectangles, and then deep-fried. Additional seasoning and ingredients such as beans, zha cai, and sesame seeds maybe added into the rice for added flavour. It has a similar appearance and external texture to hash browns. 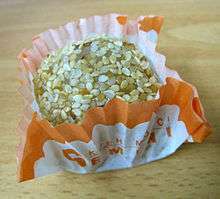 Common examples of rice snacks made with ban from glutinous or sticky rice and non-glutinous rice include Aiban (mugwort patty), Caibao (turnip bun)[This 'turnip' is not the Western turnip. The proper name is yam bean. [In Mandarin Chinese, it is known as dòushǔ(豆薯) or liáng shǔ (涼薯)] Ziba (sticky rice balls) and Bantiao (Mianpaban or flat rice noodles). Aiban encompasses several varieties of steamed patties and dumplings of various shapes and sizes, consisting of an outer layer made of glutinous ban dough filled with salty or sweet ingredients. It gets its name from the aromatic ai grass (mugwort), which after being dried, powdered and mixed with the ban, gives the dough a green color and an intriguing tea-like taste. 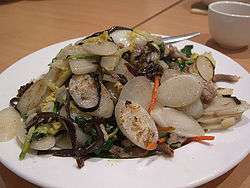 Typical salty fillings include ground pork, mushrooms and shredded white turnips. The most common sweet filling is made with red beans. Glutinous rice cooked in coconut or banana leaf wrappers are steamed to produce suman, of which there are many varieties depending on the region. 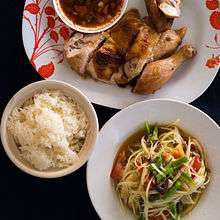 Some of the common toppings are bukayo, grated mature coconut cooked in sugar; coconut jam; and freshly grated coconut. Some regions eat suman as a snack with ripe mangoes or bananas. In suman sa lihiya (lye), the rice grains are treated with a solution of lye and dried. The grains are put into a banana leaf cone or coconut leaf wrapper and steamed. The rice may be mixed with sugar, coconut milk, or other grains such as millet. Malagkit is also used in puto, or steamed rice cakes, of which numerous variations exist. Bibingka is a general term for sweet rice cake, which is mainly glutinous rice cooked with coconut milk. Bibingka is often associated with the Philippine Christmas season. Another common Philippine Christmas tradition includes puto bumbong, a suman-like sweet dish steamed in special containers with bamboo tubes, and served with butter, grated coconuts, sugar, and sometimes toasted sesame seeds. Puto bumbong traditionally uses a special heirloom variety of glutinous rice called pirurutong, which has a naturally purple colour. Another traditional Filipino sweet snack similar to Japanese mochi is called palitao. Glutinous rice is also used in gruel-like dishes such as champorado, which is cooked with cocoa powder and sweetened. Milk is usually added, and tuyo is served with it as a counterpoint. Lugaw, goto, and arroz caldo, are all variants of rice porridge dishes, featuring glutinous rice mixed with regular rice. Bilo-bilo or binignit uses glutinous rice. 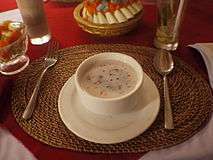 It is a sweet, thick soup made of coconut milk, jackfruit, sweet potatoes, plantain, sago pearls, and the bilo, or galapong shaped into balls. Glutinous rice is known as beras ketan or simply ketan in Java and most of Indonesia, and pulut in Sumatra. It is widely used as an ingredient for a wide variety of sweet, savoury or fermented snacks. Glutinous rice is used as either hulled grains or milled into flour. It is usually mixed with santan, meaning coconut milk in Indonesian, along with a bit of salt to add some taste. Glutinous rice is rarely eaten as staple. One example is lemang, which is glutinous rice and coconut milk cooked in bamboo stem lined by banana leaves. Glutinous rice is also sometimes used in a mix with normal rice in rice dishes such as nasi tumpeng or nasi tim. It is widely used during the Lebaran seasons as traditional food. It is also used in the production of alcoholic beverages such as tuak and brem bali. Ketan - traditionally refers to the glutinous rice itself as well as sticky rice delicacy in its simplest form. 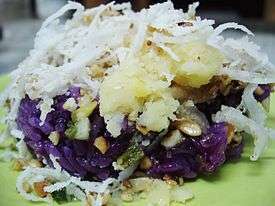 The handful mounds of glutinous rice is rounded and sprinkled with grated coconut, either fresh or sauteed as serundeng. Kuih - glutinous rice flour is also used in certain traditional local desserts, known as kuih. This include Puteri Salat. Ketupat palas - Or Ketupat daun palas, is a cooked pulut wrapped in triangular shaped crafts made from Pokok palas and left to be boiled for 3 – 4 hours to result nice shaped compression and to bring out the aroma or taste from the leaves. Inang-inang - glutinous rice cracker. Popular in Melaka. can be trace from Indonesian food. See Rengginang. In Japan, glutinous rice is known as mochigome (Japanese: もち米). 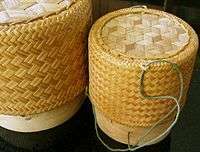 It is used in traditional dishes such as sekihan, okowa, and ohagi. It may also be ground into mochiko (もち粉), a rice flour used to make mochi (もち), a traditional rice cake prepared for the Japanese New Year but also eaten year-round. See also Japanese rice. 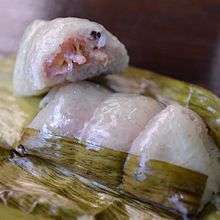 Bánh gai: made from the leaves of the "gai" tree (Boehmeria nivea) dried, boiled, ground into small pieces, then mixed with glutinous rice, wrapped in banana leaf. The filling is made from a mixture of coconut, mung bean, peanuts, winter melon, sesames, and lotus seeds. ↑ Oxford English Dictionary. glutinous, a. SECOND EDITION 1989. Online edition. Retrieved 2008-02-20. 1 2 "NC State Geneticists Study Origin, Evolution of "Sticky" Rice" (Press release). 21 October 2002. ↑ Delforge, Isabelle (2001). "Laos at the crossroads". ↑ Kenneth M. Olsen and Michael D. Purugganan (1 October 2002). "Molecular evidence on the origin and evolution of glutinous rice". Genetics. 162 (2): 941–950. PMC 1462305 . PMID 12399401. ↑ Kenneth F. Kiple, Kriemhild Coneè Ornelas. The Cambridge World History of Food. p. 143. ↑ "Sweet Sticky Rice with Coconut Cream and Black Beans*(khao niao tat)". Board.palungjit.com. Archived from the original on 29 March 2012. Retrieved 2013-05-31. ↑ "ข้าวเหนียวหน้ากระฉีก". The-than.com. Retrieved 2013-05-31. ↑ "Thai food". Thailand.prd.go.th. Archived from the original on 24 April 2013. Retrieved 2013-05-31. ↑ "Khao chi preparation". Webboard.sanook.com. Retrieved 2013-05-31. ↑ "Sticky Rice with Bananas". Thai-blogs.com. 2005-09-29. Archived from the original on 3 June 2013. Retrieved 2013-05-31. ↑ Desserts in Thailand – Thai Grilled Sticky Rice – Banana or Taro (Khao Niao Ping) Archived May 12, 2015, at the Wayback Machine. ↑ "Madam Mam Articles". Madammam.com. Archived from the original on 20 May 2013. Retrieved 2013-05-31. ↑ "Sticky Rice Ball". Library.cmu.ac.th. Retrieved 2013-05-31. ↑ "Kaeng Khae Hoi (snail curry)". Library.cmu.ac.th. Retrieved 2013-05-31. ↑ Xinhua News Agency (27 February 2005). "Sticky porridge used to cement ancient walls".